it's gratifying (yet somehow alarming) how quickly M responds to attention, her behaviour can turn around over night. we've both been missing our time together and lately i've been doing the bath/bed routine that dad had taken over since G arrived. as a result she can't do enough for me the rest of the time. it's lovely to see the considerate, caring, carefree little girl we know and love show her face a bit more often. i like the movement of the water in this picture, M's presence is definitely in the frame this time. 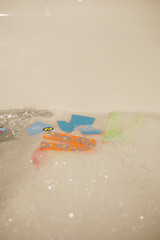 the floaty things are her dress-up stick-on bath people.